The U.S. Army just took a big step closer to getting a brand-new, high-tech ride. Yesterday the Army announced the three companies that will continue to develop the new Joint Light Tactical Vehicle, a sort of blend between today’s workhorse Humvee and the bomb-resistant MRAP trucks that have saved so many lives in Iraq and Afghanistan. Lockheed Martin, AM General and Oshkosh Defense each received around $30 million to refine their JLTV prototypes ahead of a final selection 27 months from now. At stake in the seven-year-old competition: up to 50,000 trucks for the Army and another 5,000 for the Marines, at a cost of $250,000 apiece. The nearly $14 billion program is one of the few big, near-term prizes in Pentagon budgets squeezed by war costs and the economic downturn. Some have questioned why the ground combat branches even need a new vehicle. After 11 years of war the Army and Marines are flush with fresh up-armored Humvees and no fewer than 20,000 of the hulking MRAPs, the latter costing $1 million apiece. There are so many surplus MRAPs that the Pentagon gives them away to allies and is planning to park thousands of them in overseas warehouses, where they will await the next major ground war. 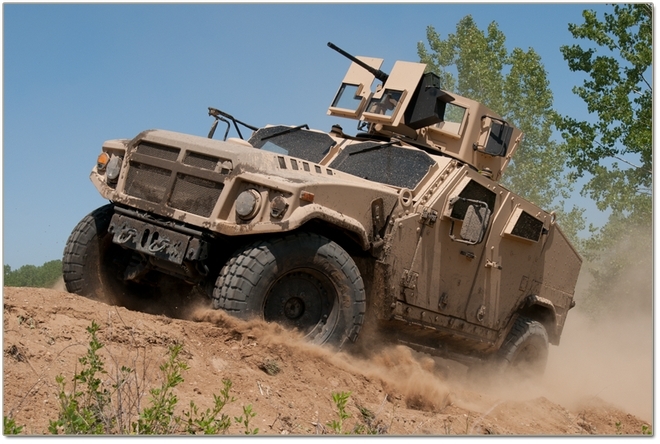 But the JLTV is special, the military argues. Thanks to its blast-deflecting shape and classified armor mix, the seven-ton new truck will have the same level of underside blast protection as an MRAP, but at half the weight. Though roughly the same dimensions as the Humvee, the JLTV “has so much more payload and so much more capability,” the Marine Corps said. The Pentagon hopes a JLTV-equipped force will be light enough to deploy quickly but tough enough to survive in the era of the improvised bomb. As the maker of the stalwart Humvee, the Pentagon’s standard truck since the mid-’80s, AM General was expected to field a strong JLTV candidate. The company calls its new vehicle the Blast Resistant Vehicle – Offroad, or BRV-O.